MAYHEM FEST Gets Back To Metal! The world’s biggest heavy music touring festival, the ROCKSTAR ENERGY DRINK MAYHEM FESTIVAL enters its eighth year with another fantastic heavy metal and hard rock line-up, featuring 13 bands performing on the ROCKSTAR ENERGY DRINK MAIN STAGE and the VICTORY RECORDS STAGE. The ROCKSTAR ENERGY DRINK MAIN STAGE will feature some of the most ground-breaking heavy bands of all time, spanning the originating years of heavy metal to today! The main stage will feature five-time-nominated, two-time Grammy winning legends Slayer as headliner, as well as additional performances from King Diamond, HELLYEAH, and The Devil Wears Prada. The VICTORY RECORDS STAGE will feature headliner Whitechapel as well asThy Art Is Murder, Jungle Rot, Sister Sin, Sworn In, Shattered Sun, Feed Her To The Sharks, Code Orange and Kissing Candice. “It has been eight years and it feels like it started just yesterday. 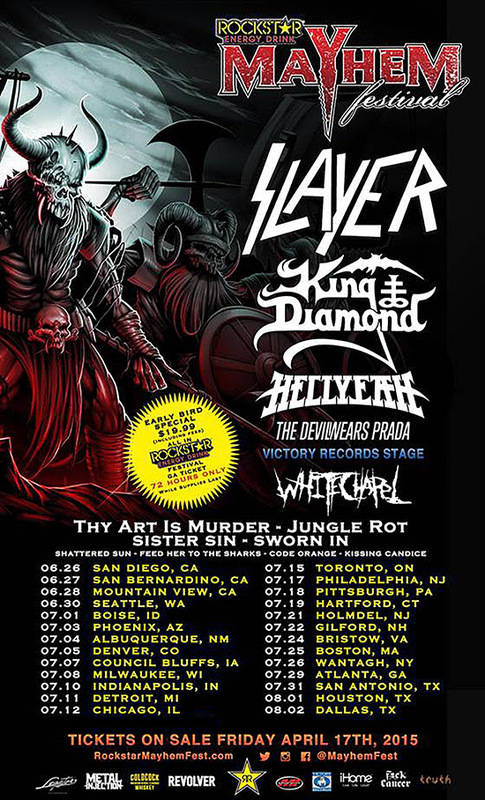 We are so excited about this year’s lineup and having the mighty Slayer back in support of a new album. In addition, the first time for King Diamond and HELLYEAH will be awesome, as well as The Devil Wears Prada’s first time on the Main Stage. The Victory Stage has amazing bands and will play throughout the day. Heavy music is thriving in America and we are excited to be a part of it,” state John Reese and Kevin Lyman, ROCKSTAR ENERGY DRINK MAYHEM FESTIVAL producers. Tickets for the ROCKSTAR ENERGY DRINK MAYHEM FESTIVAL go on sale beginning April 17th at 10:00am local time. Please note – Houston, TX tickets go on sale on April 24th at 10:00am local time. General Admission Festival and Lawn Tickets are only $19.99 including all fees for the first 72 hours of on sale (while supplies last). * Lineups in each city may vary. Go to www.rockstarmayhemfest.com for full lineup details. Meet This Year’s ROCKSTAR ENERGY DRINK MAYHEM FESTIVAL Bands! The Chicago Tribune’s Greg Kot wrote that the five-time-nominated, two-time Grammy winning Slayer is “one of the great American rock bands of the last 30 years, forget about genre.” Their membership in “The Big Four” – Metallica, Slayer, Megadeth and Anthrax – the four bands that defined the thrash/metal genre – secures their place in music history. Indeed, few bands come close to matching the intensity that Slayer brings to its live shows, having been named “Best Live Band” by numerous media outlets including Revolver, SPIN, and Metal Hammer. With songs that mirror the turmoil and aberrations of our society – God’s terrifying global genocide, the chaos of our broken political system, chemical warfare, the hideous minds of serial killers, and the way-too-close proximity of world horrors that technology has brought us, Slayer remains crushing and brutal, steadfastly refusing to cater to the Mainstream. Slayer’s founding member, guitarist Jeff Hanneman passed in 2013, and Exodus guitarist Gary Holt has been filling in since. Paul Bostaph, who was Slayer’s drummer from ’94 – ’01, has rejoined bassist/vocalist Tom Araya and guitarist Kerry King, and is back behind the kit. Slayer is currently in the studio recording a new album set for a 2015 release. King Diamond’s Dreams of Horror double album was released in November of 2014 and is the only best-of compiled and approved by the band. The tracks were remastered and enhanced by Andy LaRocque and King Diamond himself. Give Me Your Soul…Please, King Diamond’s 2007 full-length, was nominated for a “best metal performance” Grammy Award! The Devil Wears Prada recently announced their return to Rise Records and their next release, a conceptual EP entitled Space, coming in summer 2015. The Space EP marks the band’s first concept release since Zombie and the first on Rise Records since their sophomore release, Plagues, in 2007. Zombie debuted at #11 on the Billboard Top 200 Album Charts in the summer of 2010. The band is currently headlining the “Zombie 5 Tour” to celebrate the fifth anniversary of the acclaimed EP. Whitechapel’s Our Endless War was released in April of 2014 and it debuted at a staggering #10 on the Billboard Top 200 charts, as well as #1 on both the iTunes rock and metal charts. Watch Whitechapel’s latest video, the intense and bloody Mitch Massie-directed “Let Me Burn”, nowHERE. Australia’s incendiary extreme musical export Thy Art is Murder, return with one of the most anticipated releases of the year. Produced and mixed by Will Putney (Suicide Silence, Exhumed, The Acacia Strain), Holy War is the band’s second release for Nuclear Blast Entertainment and third full-length album overall. Holy War will be available in various formats (digital; limited digi-pak + bonus track; assorted color vinyl; exclusive mail-order picture disc) and unleashed in North America on June 30th, in Europe & Australia on June 26th, and in the U.K. on June 29th. Lead by one of Revolver Magazine’s Hottest Chicks of 2015, Liv Jagrell, Swedish heavy-metal band Sister Sin have been riding high since the release of their October 2014 album, Black Lotus. Currently wrapping up a hugely successful, high-voltage tour with UDO in Europe, the no-nonsense four-piece is ready to take over the States once more, delivering a real dose of rock ‘n roll to the masses. Poised to dominate the metal scene comes Texas melodic metal six-piece, Shattered Sun, with their Victory Records debut album, Hope Within Hatred (out April 21st). Currently crushing venues across the US as direct support to Testament and Exodus, Shattered Sun has come along “with all the riffs, all the hooks and several fucktons of heavy metal fury” assures Metal Hammer. Australian quintet, Feed Her To The Sharks, are out for blood and proved such with their 2015 Victory Records debut album, Fortitude, which was applauded by BLUNT Mag for “taking metalcore back to its riffy, growly roots”. Having conquered their own metal scene, performing on the 2013 Van’s Warped Tour Australia and constant touring since, this band is ready to unleash their dynamic, merciless live show onto the masses this summer in the States. Code Orange’s I Am King was released in September of 2014 and debuted on the Billboard 200 at #29. The album quickly peaked at #10 on the Billboard Top Hard Rock Albums chart and has gained rave reviews from music critics and fans alike. Watch Code Orange’s latest video, “Dreams in Inertia”, HERE. Theatrics are promised with each performance and every listen of New York’s gore-metal purveyors, Kissing Candice, who will be unleashing their Victory Records debut album this summer in time for the Mayhem festivities. Can’t wait? Catch the blood-soaked, masked madmen of Kissing Candice performing alongside Twiztid and Davey Suicide, beginning May 1st. Remember – get your tickets beginning Friday, April 17th at 10:00am local time! We’ll see you in the pit! 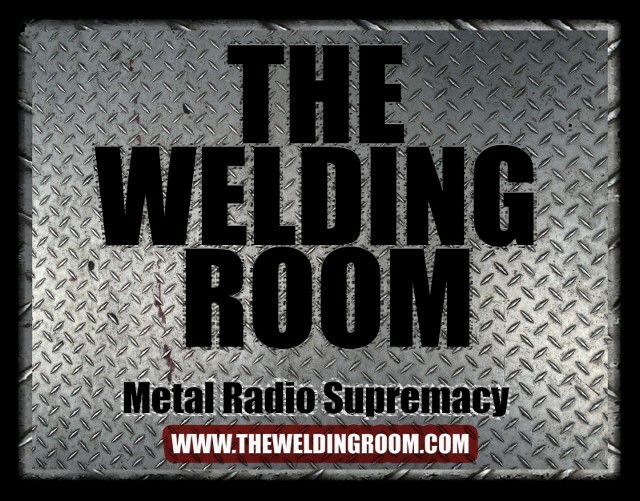 This entry was posted in METAL and tagged #TheWeldingRoom, #TWRradio, Hell Yeah, Jungle Rot, KING DIAMOND, Mayhem, Metal Blade Records, metalfest, Revolver, Rik Johnson, Rockstar Energy, Rockstar Energy Mayhem Festival, Sister Sin, Slayer, Sworn In, The Devil Wears Prada, Thy Art Is Murder, Victory Records Stage, WhiteChapel. Bookmark the permalink.